It has been revealed that as many as 732 drug offenders have been arrested in Katsina State, out of which 50, were students of various tertiary institutions in the state. 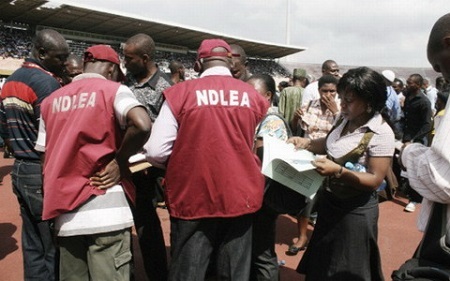 According to Vanguard, the State Commander, the National Drug Law Enforcement Agency, NDLEA, Hajiya Maryam Sani disclosed this, yesterday, while briefing newsmen on successes recorded by the command from January to December, 2017. Hajiya Sani said the command also arrested 13 females while about 432 kilograms of illicit substances were also seized from the suspects. “In Katsina State, from January to December 2017, our officers and men arrested 732 drug offenders out of which 13 are females, 20 of these offenders are under the age of 18 years, while 50 of them are students of various higher institutions in and around the state. “During the period under review, a total of 432kgs of illicit substances were seized from drug dealers and users, a total of breakdown of which shows: Cannabis Sativa 246.7 Kg, Psychotropics 185.2kg and Cough syrup with codeine 99.675 litres. “The prosecution and legal services unit which is charged with responsibility of instituting legal proceedings against drug offenders, secured 44 convictions at the federal high court Katsina (the convicts are serving various terms and has 82 cases at various levels of prosecution while it Drug Demand reduction unit, has counselled 610 persons out of which 8 are females and 22 went through the rehabilitation process,” she said.